Classical liberalism is one of the most important political and social philosophies. Indeed, this set of ideas was crucial in bringing the modern world into existence. It fostered a political climate in which economies were free to develop and government limited in scope, essential conditions for the unprecedented increases in living standards seen over the last two centuries. 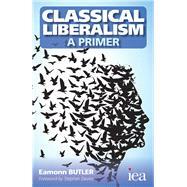 Yet despite its huge contribution, today classical liberalism is poorly understood and often misrepresented, its insights neglected in an era of pervasive state intervention. Eamonn Butler's primer is therefore extremely welcome. It is an extremely clear and well set out introduction to this way of thinking. As such, it is highly suitable for students of the social sciences and makes a valuable contribution to greater understanding of a perspective that is enjoying a long overdue revival.